36" LAWN ROLLER (No. 990227) Weighing 430 lbs. 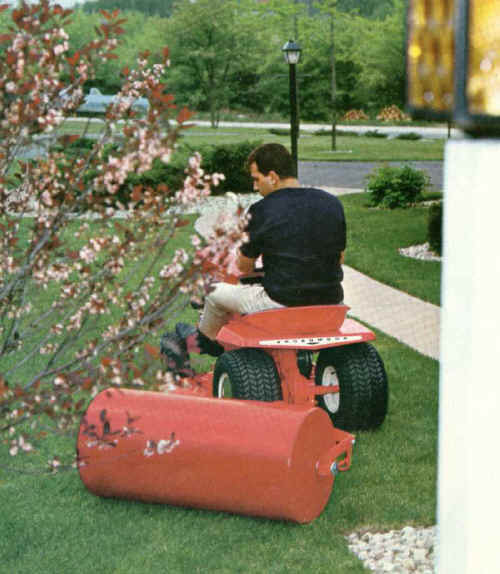 when filled with water, this lawn roller smooths a 3' wide area. Spring-loaded scraper blade keeps roller clean during operation. Roller is 18" in diameter, constructed of heavy 12 gauge steel for durable long life. NO MATTER how you look at or operate the brand new Broadmoor, it spells deluxe comfort as only a Simplicity tractor can deliver. Its 9-1/2" wide rear tires assure you not only of a jolt-free ride, but a mark-free lawn. You'll never leave evidence of where you've been. The Broadmoor has been Simplicity's best seller for years. Yet, this year's model is proof that even a top unit can be improved still more. The new Broadmoor 717 features a 7 horsepower "synchro-balanced" engine, which reduces vibration by 80%. So even the big jobs won't tire you. Further putting comfort foremost is its contoured, deep-padded bucket seat, conveniently located, easy-to-operate controls, and its all-season attachments. A new controlled traction feature has been added this year, too, providing driving torque to both wheels. Even when one wheel is on a slippery surface, the other wheel continues to drive. The new Broadmoor is more versatile than ever, with a host of new all-season attachments that make this deluxe tractor capable of tackling any lawn and garden task you ask it to master. It now handles a 36" rotary mower.., letting you level a full 3 feet of grass in one pass.., without scalping a blade, thanks to the famous Simplicity patented mounting feature. The Broadmoor is much more than a mower . . . it also steps out briskly with a 42" snow plow and dozer blade . . . a 3-gang mower . . . a 32" rotary snow thrower . . . and 40" weed and brush cutter. Typical of Simplicity units, you switch all of these attachments in minutes, without tools. Spunky as the Broadmoor is in tough going, it's easy to boss. Its geared steering mechanism lets you circle small flower beds and shrubs in one pass, edging within a half-inch of trees and fences. That means less jockeying to cut up close, and a lot less hand trimming. This deluxe beauty has comfort that never quits. Feature for feature, it's "Suburbia's Buy of the Year" . . . the ideal combination of power, performance and versatility . . . for the average homeowner with above-average tastes.